Personal profiles on Facebook and other social-networking sites are a trove of inappropriate and embarrassing photographs and discomfiting breaches of confidentiality. You might expect that from your friends and even some colleagues  but what about your doctor? A new survey of medical-school deans finds that unprofessional conduct on blogs and social-networking sites is common among medical students. 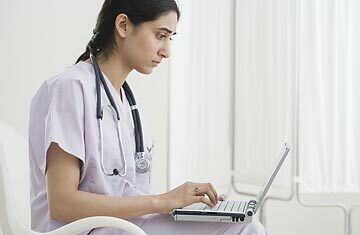 Although med students fully understand patient-confidentiality laws and are indoctrinated in the high ethical standards to which their white-coated profession is held, many of them still use Facebook, YouTube, Twitter, Flickr and other sites to depict and discuss lewd behavior and sexual misconduct, make discriminatory statements and discuss patient cases in violation of confidentiality laws, according to the survey, which was published this week in the Journal of the American Medical Association. Of the 80 medical-school deans questioned, 60% reported incidents involving unprofessional postings and 13% admitted to incidents that violated patient privacy. Some offenses led to expulsion from school. "I didn't expect to find so many incidents of unprofessional conduct," says Dr. Katherine Chretien, medicine-clerkship director at the Washington, D.C., Veterans Administration hospital and the lead author of the study. As a physician responsible for counseling medical students and residents, Chretien says she assumed that students were "educated about professional conduct online and used better judgment." But medical students, it seems, are no different from the rest of us when it comes to posting drunken party pictures online or tweeting about their daily comings, goings and musings  however inappropriate they may be. Many students feel they are entitled to post what they wish on their personal profiles, maintaining that the information is in fact personal and not subject to the same policies and guidelines that govern their professional behavior on campus. Though medical students would agree that physicians  and other professionals, like teachers  should be held to a higher standard of integrity by society, the new study suggests that they're confused by how rules apply, especially in cyberspace, once the white coat comes off. "They view their Facebook pages as their Internet persona," says Dr. Neil Parker, senior associate dean for student affairs for graduate medical education at UCLA's David Geffen School of Medicine. "They think it's something only for their friends, even though it's not private." That attitude is largely dictated by age, says Parker. In focus groups involving students, faculty, administrators and staff, the school has found a clear generational divide between those who tend to blur the line between their personal and professional lives and those who don't. Younger students were more likely than older staff members to believe that their thoughts and opinions were valid to post online, regardless of their potentially damaging or discriminatory impact on others. The issue is especially relevant when it comes to discussing patient cases. Laws prohibit doctors from talking about patients using individually identifiable information. However, as Chretien notes, sharing patient-care experiences can be a useful and powerful learning tool for medical students that encourages "reflection, empathy and understanding," she writes in the paper. Although discussing their experiences online may be allowed, students must be made aware that identifying information is not limited to patients' names and that divulging other characteristics and details often violates patient-privacy laws. It's that type of education that medical schools need to include more in their curricula, says Chretien. Ensuring that students are aware of privacy settings on social-networking sites is another. At UCLA, Parker has assigned a task force, which includes students, to devise guidelines that students can follow when making decisions about what to post and what to keep to themselves. "It's going to be difficult," he says. "Most students want us to provide them with education and guidelines, but not policies. It is a different culture; we always say we have to be culture-sensitive to our patients, but we have to be culture-sensitive to our students as well."